Why Pilgrim scallop is named “St James shall”? Because St James employed it to contain the water to use for pilgrim blessing. Extract from shells (washed and opened by a knife) the molluscs. Tire to low fire the white part of leeks cutted into dices and minced shallot with oil. Let cool, make a purea and salt. Cut the green part of links and put them in water and ice to make them crisp. Dry and fry in plentiful warm oil to obtain crisp threads. Wrap every slice of bacon around each scallop and cook in a pan oil greased. 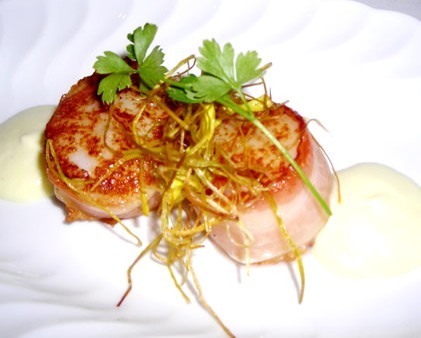 Put in every dish two scallops surmounted by shrubs of fried leeks and surround with leeks sauce. Decorate with parsley leafs. Yellow straw-colored, fresh and floral with yielded notes of apple, citrus and white melon, elegant and soft.